Trimet tests technology to create 1.12 gigawatt-hours of flexible capacity. 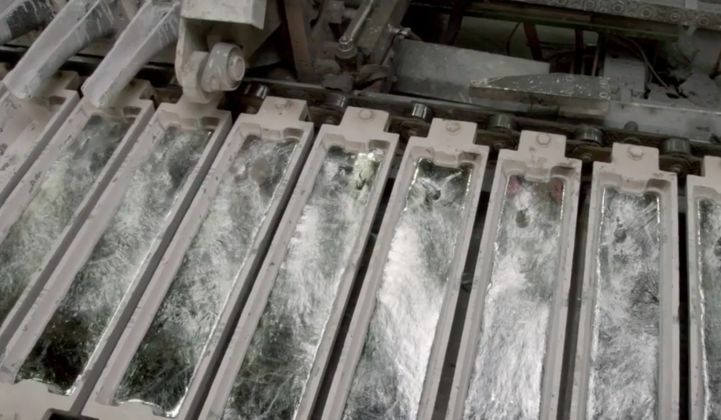 Trimet, Germany’s largest producer of aluminum, is testing technology to turn its smelters into a "virtual battery" capable of delivering 1.12 gigawatt-hours of flexible capacity. The family-owned business is investing €36 million ($39 million) in a two-year industrial-scale pilot of systems that will allow power use across 120 electrolysis cells to be dialed up or down by 25 percent in either direction, for up to several hours. The pilot is being carried out on a single production line in Trimet’s Essen aluminum smelter. The production line will be able to compensate for fluctuations in the power grid, making it easier to manage intermittent renewables. The virtual battery concept relies on adjustable heat exchangers, developed with help from the University of Wuppertal in North Rhine-Westphalia, that can maintain the energy balance in each electrolysis cell irrespective of changing power inputs. The technology also ensures that power fluctuations do not affect the magnetic fields in the electrolysis cells. The capacity of the test production line alone is comparable to a medium-sized pumped-hydro storage power plant. “With an efficiency rate of 90 to 95 percent, the virtual battery is a lot more efficient than technologies such as power-to-gas or compressed-air reservoirs,” said a source within the company. “Furthermore, no new power lines are needed, as the smelter is already integrated in the high-voltage grid." As a major industrial power user, Trimet already participates in German demand response programs, taking its aluminum smelters offline for short periods when required to stabilize the grid in the face of load surges. According to a 2014 Bloomberg report, the company uses 14 megawatt-hours of energy to make each ton of aluminum. In its 2015-2016 fiscal year, which was completed at the end of June last year, the company produced 775,000 tons of aluminum and cast-iron products, a 5 percent increase over 2014-2015. Trimet is making efforts to mask the environmental impact of this almost 100-terawatt-hour annual consumption level, for example by recycling 95 percent of all production residues and hosting a three-turbine wind farm at its smelter in the port of Hamburg. In Essen, where Trimet produces 300,000 tons of cast aluminum products a year and is the largest industrial employer, the company used its virtual battery pilot as a lighthouse project in the city’s winning bid for European Green Capital in 2017. Trimet says that implementing its technology across Germany’s four aluminum smelters, three of which it owns, could provide a demand response capacity equal to a third of Germany’s 40 gigawatt-hours of pumped hydro storage. Tim Grejtak, energy storage analyst at Lux Research, pointed out that Trimet’s concept was not the same as a true molten battery, such as the liquid metal design being pursued by Ambri. As reported in GTM, Ambri's technology is inspired by the economies of scale facilitated by modern electrometallurgy and the aluminum smelter. But Ambri is building a true battery. “To be clear, Trimet is doing no such thing, but is rather just being economical with how it purchases its power,” said Grejtak. That isn’t to say it’s a bad idea, he added. “Large industrial and commercial dispatchable loads, like aluminum smelters, can be compensated through demand response programs for delaying being turned on during periods of peak demand, or encouraged to turn on during low periods of demand,” he said.